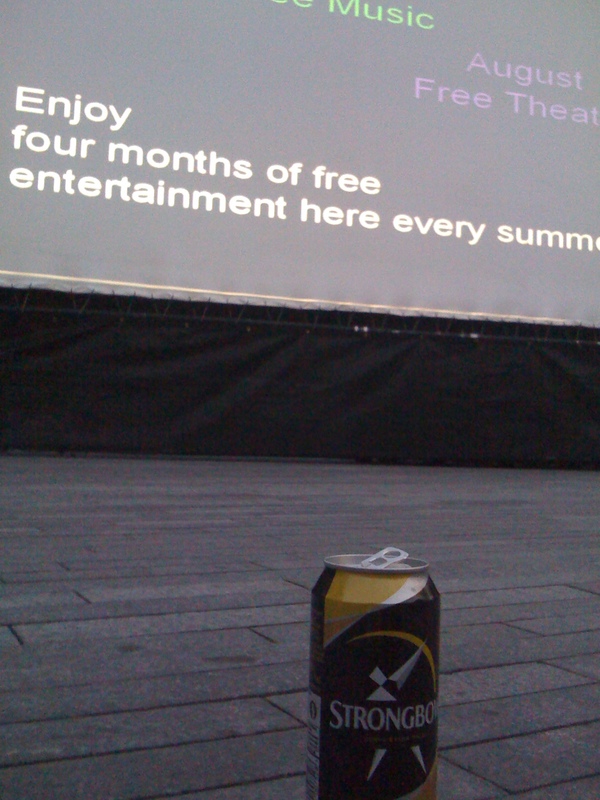 Free Outdoor Movies at the Scoop until October 1st. When my plans for Wednesday night were canceled at the last minute, I thought to myself “Hey, I wonder when those free outdoor movies at The Scoop go on?” A quick check of my email revealed that they started that very night in just a few hours. Even better, the movie that was scheduled (Up in the Air) was something that I wanted to see. Although it was tempting to be lazy and stay at home, I knew if I got out I would be richly rewarded. I decided to make the More London outing a 2 fold endeavor. I would walk there and that way I would get a good bit of exercise on the way. 3 miles? I could do it! I left with an hour of time ahead of me. On the way, I realized I didn’t have any cash. Maybe I should stop by the cash machine. And oh yeah, while I’m near the Tesco Metro, maybe I should pick up a tasty beverage. All of this meandering ate away at my walking time. At about 7:05, with 2 miles to go, I started panicking that I wouldn’t make it on time and thus hopped on the tube. Exiting at London Bridge, I made my way toward More London. I wasn’t sure what I was looking for. Luckily, the area was labeled conspicuously. 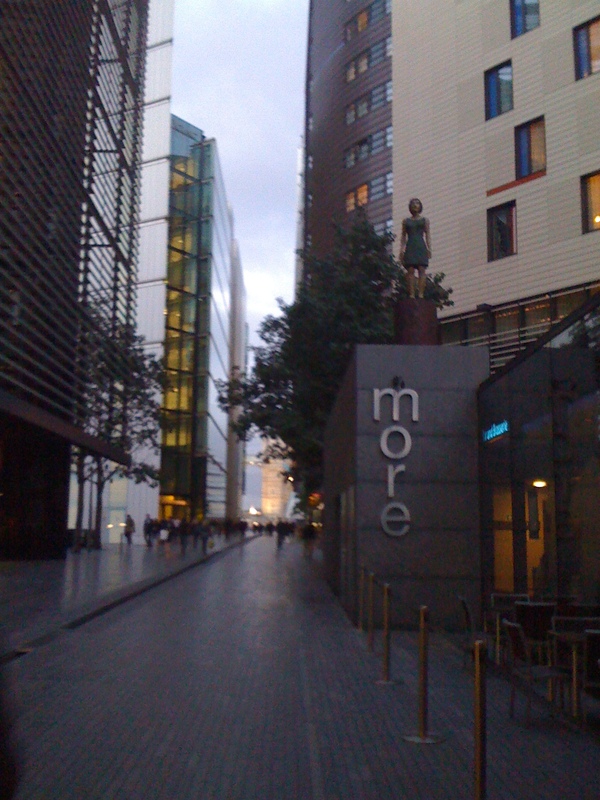 I was happy to find myself amongst a nice design of water features and sleek finishes wedged between buildings that overlooked the Thames and Tower Bridge. With only 5 minutes to spare, I rushed towards the outdoor amphitheatre, had my hand stamped by a staff member, and created a seat right up front. The Scoop - the photo blurriness is quite accurate considering my rushed dash to find a seat. Whew, I could now enjoy my cold beverage and relax. Next time I plan on bringing a full picnic, a friend and a blanket. The weather is getting really chilly at sunset these days. I knew autumn would come, but did it have to come so soon? Can’t we negotiate on this? I enjoyed Up In the Air. The best parts? George Clooney (yum), loved Anna Kendrick’s character (as a former 23 year old fresh college grad I could relate to her annoying naivety), and the opening song by Sharon Jones and the Dap Kings. I totally forgot that their cover of Woodie Guthry’s This Land is Your Land got picked up for the opening credits. 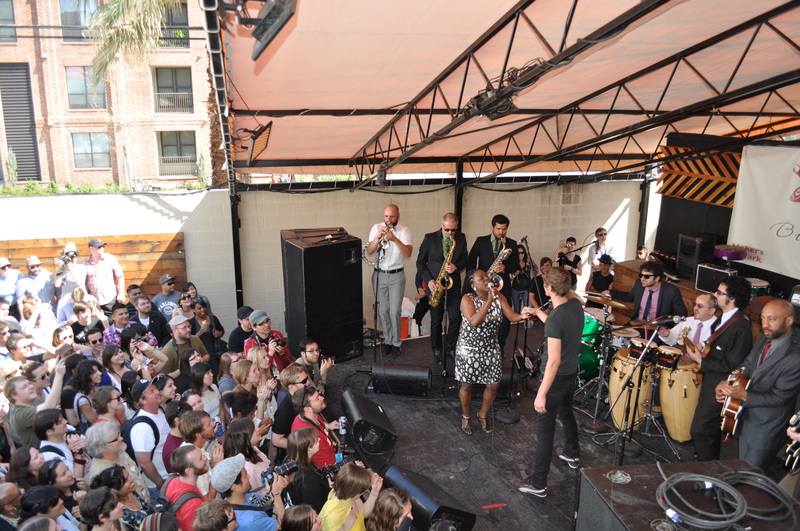 I’ve seen them jam out several times- at Austin City Limits festival in 2008, at a fundraiser for the democratic party of Tarrant County right as Obama was being elected, and at SXSW in 2010. They’ll be in London November 3rd at the Roundhouse. Go check them out. They put on a great show full of retro nostalgia, glamour and honesty. I couldn’t be happier for them for their success. 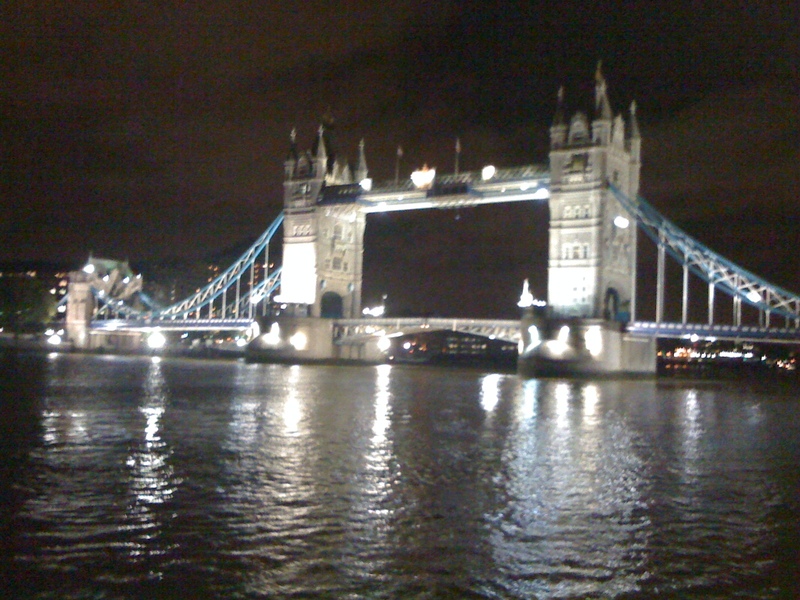 When the movie was over, I was treated to this lovely view of Tower Bridge. 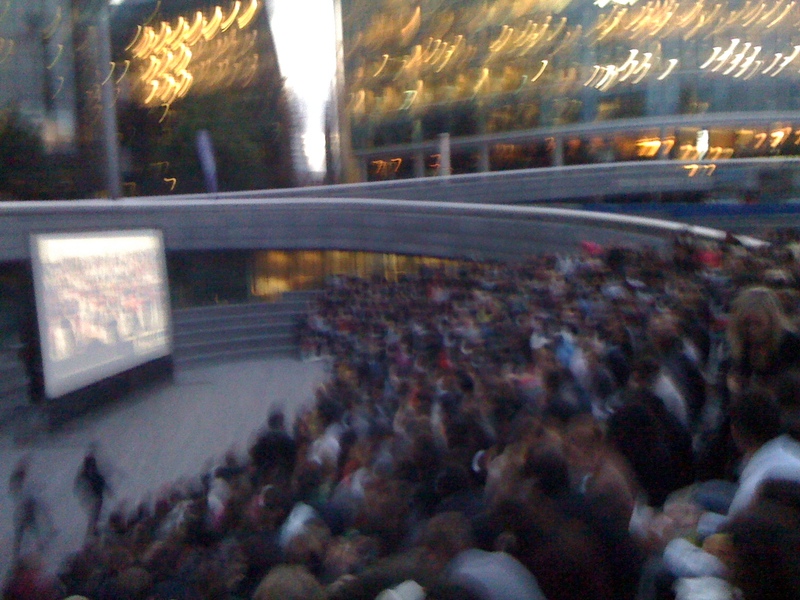 Free outdoor movies at the Scoop continue every Wednesday, Thursday and Friday throughout September and begin at 19:30. Here’s a list of remaining shows. Fri 24 Sept – Pretty Woman (1990, Cert 15) – celebrating 20 years since its release. Thur 30 Sept – Up (2009, Cert U) – non 3D version of the superb animation. Fri 1 Oct – Dirty Dancing (1987, Cert 12A) + a special Dirty Dancing workshop!